thundering from the raw ribcage of our bedroom. home, a country a point of reentry for us both. 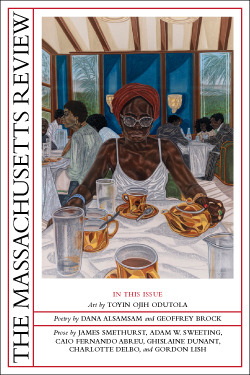 What inspired you to write “In the Tropics,” your poem in the current issue of the Massachusetts Review? The jumping-off point of the poem is the misery of being sick with fever and congestion and phlegm in the tropics with its sweltering heat and humidity. It was such a bodily thing, and for me it situated my husband in this new context. In 2015, I was fortunate enough to receive a Fulbright fellowship to the Philippines, the country of my birth, and doubly fortunate enough to take along my husband who hails from farmland Nebraska. We were on the island of Negros. While I mostly was chained to my desk writing poems and researching poetics, my tall, blond, blue-eyed husband was navigating the tropical outdoors, running errands and encountering the cultural intricacies of the port town of Dumaguete. The poem muses on this reversal: a white American a visible minority in the landscape. It explores how one deals with “exotic” surroundings, how the body is pulled and stretched and fitted into. The Philippines, which, for me, is both real and imagined. I will always write about my motherland. I’ll go back to my first undergraduate poetry writing workshop, taught by the magnificent poet Gail Wronsky. I considered this poem my “breakthrough,” the third or fourth piece I workshopped in class. It was a multi-sectioned, two-paged poem about my father and the difficulties and beauty of our relationship. The emotionally rawest piece I’d written, the poem hinged on the central imagery of “The Sword in the Stone” (legend of King Arthur) conjured with a table knife and a stick of butter. Yes, it wasn’t a very good poem and it didn’t survive, but writing that poem I realized there was a rigor and a passion in me. I used to be fussier with writing rituals—cup of tea, the right pen and paper, etc.—but nowadays I’m simply grateful when I’m writing. Hence, it could be anywhere. The subway. Sneaking a line or two while there’s a lull in the office. Sure, I’d prefer being at my desk, diligently writing, but it’s OK, too, being in bed with my journal. If you look at the acknowledgement pages in my books, you’d be privy to the soundtrack for each collection. In Imago, I thanked musical artists from Kate Bush, PJ Harvey to Belle and Sebastian. In Threshold, I cited specific albums and songs, among them: M. Ward’s “Transistor Radio,” Fleetwood Mac’s “Rumours,” Nick Drake’s “Bryter Layter,” Neil Young’s “Harvest Moon,” and Rihanna’s “We Found Love.” As I grow older, however, I crave silence in my creative process, in my thinking, the deep dive. I still love music but my consumption of it has changed. When writing or editing ideally I’d hunker down, but living in the city I take whatever quiet I can get. Too many to list, but here’s a spattering: Philip Levine, Sharon Olds, Galway Kinnell, “Angels in America,” “Noli Me Tangere,” “Dubliners,” Li-Young Lee, “Rid of Me,” “Moonstruck,” “Bright Existence,” “The Immense Journey,” “My So-Called Life,” “Buffy, the Vampire Slayer,” John Steinbeck, “Little Earthquakes,” “Car Wheels on a Gravel Road,” Soledad Barrio and Noche Flamenca, Carlos Bulosan, “To Kill a Mockingbird,” “The Golden Girls,” “Blue,” Truman Capote, “Long Day’s Journey Into Night”. . . I typically read several books at a time of varying genres, and on this particular week in December I’m devouring the following titles: In a Day’s Work by Bernice Yeung, Ghost Of by Diana Khoi Nguyen, and There There by Tommy Orange. On the horizon I’m rereading Jessica Hagedorn’s oeuvre—Dream Jungle, Toxicology—since I’m writing a persuasive paper on her influence in letters. On my holiday trip to Ireland I’m taking Elena Ferrante’s My Brilliant Friend (I’m going to attempt to read Ferrante again) and Gina Apostol’s Insurrecto. I’d dreamed to be a dancer, or a wildlife photographer. 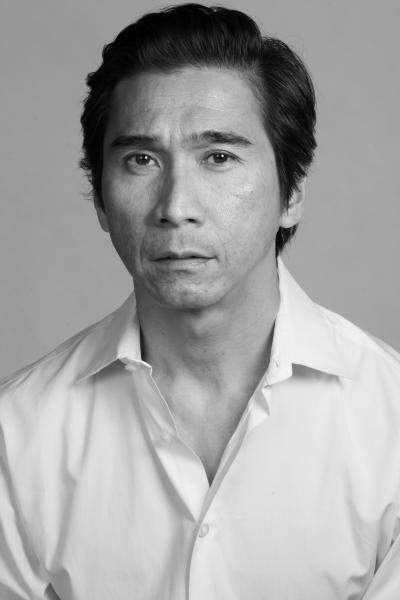 JOSEPH O. LEGASPI is the author of the poetry collections Threshold and Imago, both from CavanKerry Press; and three chapbooks: Postcards (Ghost Bird Press), Aviary, Bestiary (Organic Weapon Arts), and Subways (Thrush Press). Recent works have appeared in POETRY, New England Review, World Literature Today, Beloit Poetry Journal, and the Academy of American Poets’ Poem-a-Day. He cofounded Kundiman, a national nonprofit organization dedicated to nurturing generations of writers and readers of Asian American literature.